Now through June 30th, 2016, purchase and register any new Apollo rackmount audio interface and you’ll be able to turn your workstation into a virtual SSL analog studio — with free plug-ins from SSL and Universal Audio. Get the SSL 4K Channel Strip Plug-In and EP-34 Tape Echo Plug-In FREE! 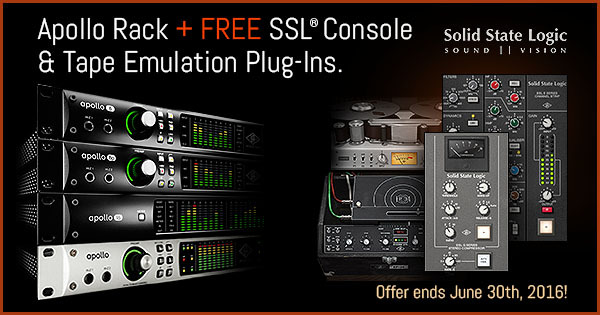 Get the SSL 4K Buss Compressor, SSL 4K Channel Strip, and EP-34 Tape Echo FREE! Get the Oxide Multi-Track Tape Recorder, SSL 4K Buss Compressor, SSL 4K Channel Strip, and EP-34 Tape Echo FREE! No coupons or redemption codes are necessary. The promotional plug-ins will be automatically added to your account once you register your new Apollo. Already own any of the promotional plug-ins? No problem. Purchase and register a new Apollo rackmount interface and you’ll receive a single-use coupon of equal value to the plug-in(s) you already own. Shop Apollo Now or contact your RSPE sales specialist to get your free plug-ins.